We are pleased to announce a gorgeous litter of 12 Sheepadoodles born December 4th. Based on their 54 pound Standard Poodle mom and 63 pound Old English Sheepdog dad, we expect this litter of puppies to be 50-65 pounds. We're thrilled with the variety of markings in this litter, giving each pup a unique look. They have wonderful personalities, love playing with each other and have been so much fun to raise. We believe they will make outstanding family members for a few fortunate forever homes. Fantasia is a beautiful black and white Sheepadoodle with a soft coat. Fantasia has a wonderful personality, and she is sweet, loyal, and loving. Her soulful eyes seem to see straight into your heart! Fauna is a sweet Sheepadoodle with a gorgeous black and white coat. Fauna loves to play with all of her siblings and is always down for an adventure! She has a show-stopper coat and will turn heads wherever she goes! Felice is a gorgeous Sheepadoodle with a thick, bi-color coat. Felice loves to play outside with her siblings, but her favorite thing to do is snuggle. We love her sweet spirit and know that her forever family will too! 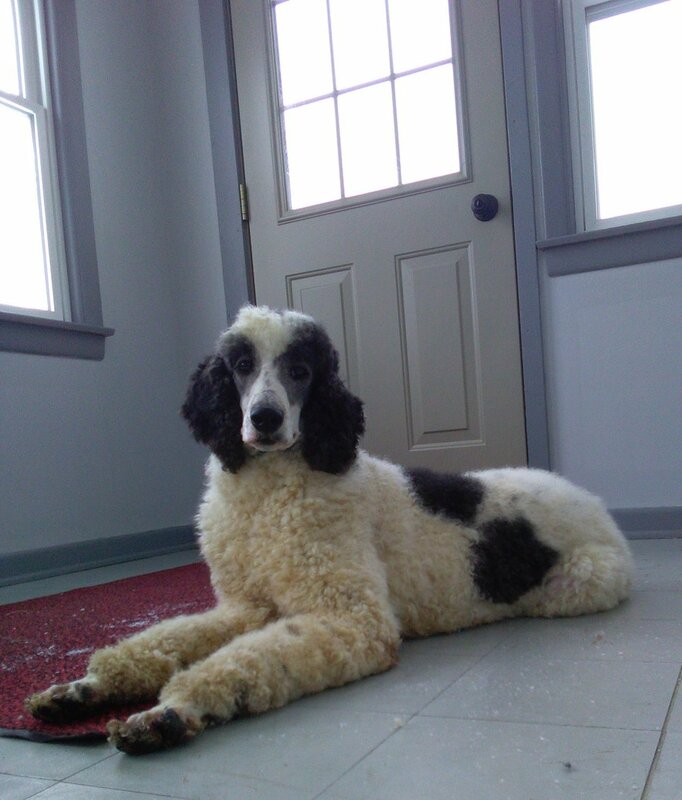 Fairy is a lovely Sheepadoodle girl with perfectly placed black markings. She is our princess! She's sweet-natured, very smart and we know that she will continue to spread joy wherever she goes! Fipsie is a highly intelligent pup with an affectionate temperament. She is fun-loving and should be a breeze to train! She is a beautiful pup inside and out! Flo is a breathtaking little girl with a thick, wavy black and white coat. She is a cheerful puppy who loves to play! We are excited to match her with her lucky new family! Freiya is a beautiful black and white Sheepadoodle with unique markings. She loves to play with us and will do almost anything to score some loving! Freiya loves to cuddle, and she is sure to grace her forever home with a new best friend! Fango is a stunning male black and white Sheepadoodle. He is a sweet, intelligent pup who loves play time. We think that Fango will be easy to train and will be a wonderful addition to the lives of any lucky family or individual! Flix is a handsome bi-color Sheepadoodle with a loving temperament. Flix is a smart little guy, and we have loved watching him grow into such a wonderful puppy. He is intelligent, loving and loyal and will make a wonderful furry family member! Fello is a an adorable male Sheepadoodle with a black and white coat. He loves to have fun, and is very intelligent. Fello is a happy puppy who loves kisses! Fiz is a beautiful black and white Sheepadoodle with a super glossy coat. Fiz is sweet puppy that we have loved raising! He will make a great addition to any home. Fletcher is a black and white Sheepadoodle with markings that draw attention to his captivating eyes. Fletcher is loving, loyal, and super smart. He has a contagious love for life, and we think that he is going to be a breeze to train!